Fish Hoek parkrun started on 21 Dec 2013. 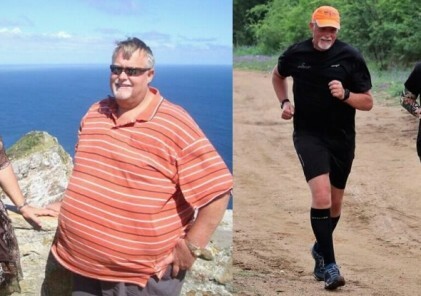 Since then, over 7,000 different parkrunners have completed the course in the Cape. Event Director Richard Healy tells us more. How did Fish Hoek parkrun come about? I started it because I’d recently moved into Fish Hoek and was missing my running group from Hout Bay, so I got some people interested in running with me in the evenings. But, I wanted to get a group together to go running on a Saturday morning and try get the social thing going afterwards at a coffee shop, like we did in Hout Bay. I’d never heard of parkrun and one of my friends send me a Discovery email they got about parkrun. I immediately sent a reply email to Bruce Fordyce because it sounded just what I wanted to get going. I was helped by Adele Pudney and my wife, Sue in setting up the event. What have been the highlights of your event so far? There have been so many highlights, one is how often people tell me their families have benefited from having something to do together on a Saturday morning. I think one family, especially the mom, sticks out – they were all waiting at the finish funnel to cheer their mother back in who had walked around and was red in the face, amongst the final finishers, and I’m sure she won’t mind me saying, very overweight. She was huffing and puffing, and I was quite worried about her health. The cheering from all her children, was infectious to see, and the volunteers joined the cheering as well. This lady was back again, and again. Eventually she got her 50 and has done another 25 since. What is so inspiring is the cohesive family and the progress she has made, taking 15 mins off her time and having lost a lot of weight! Who helps to make your parkrun a success? We’ve had volunteers like Wendy, who was a fabulous cheer leader, like Keith who doesn’t walk/run but is the pro scanner, and in the early days there was Carol who did timing and tokens and with Sue were the only two volunteers. We’ve got a growing team of regular volunteers, and I realised as soon as I got out of the way and left the volunteers get on with their tasks, they’ve stepped up and brought their talents to make Fish Hoek such a fabulous parkrun. I think Neville and Theo need to be mentioned as they’ve put up the course markers every Saturday morning, even getting up earlier when they went off to tour other parkruns and pick up when they got back later in the day. Then there’s Sue who made the milestone flags and has volunteered so many times we’ve lost count, and she’s been in the background filling in wherever she’s needed. What makes your parkrun unique? 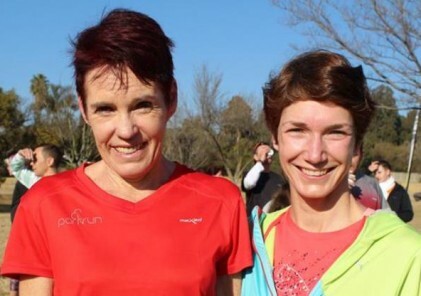 Fish Hoek parkrun has a wonderful friendly family feel, yet there is a highly competitive bunch at the front end that range in age from juniors to 60+ running sub 20mins over a flat challenging route. What is the route like? It’s a flat course, but deceptively challenging, having a complete variety of surface from wide gravel track, soft grassy sports fields, soft sand single track to hard paved pathways, that makes it about a minute, minute & half slower than say one run on hard surface. Most of the route runs along a water course with pools and streams bordering the Table Mountain National Park. 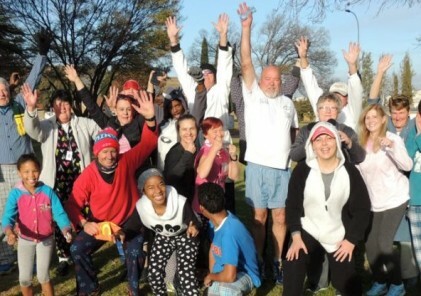 What are the typical Fish Hoek parkrunners like? We have youngsters from 5yrs to octogenarians, families and couples starting their lives together and couples who have children that have left home. Have you had any notable visitors? All visitors are notable, but we’ve had the swallows (people who follow the sun spending time in the UK and time in Fish Hoek) and we have two that I know of who were at Bushy Park soon after parkrun started, but their home run is Fish Hoek! What are the running success stories from Fish Hoek? A group of parkrunners who call themselves the Happy parkrun Group on WhatsApp definitely need a mention, the guys are called the Silver Bullets, because they are well all over 60, they are fast, and they regularly win their age categories at organised races. A lady in that same group who has also taken podium positions in her age group. 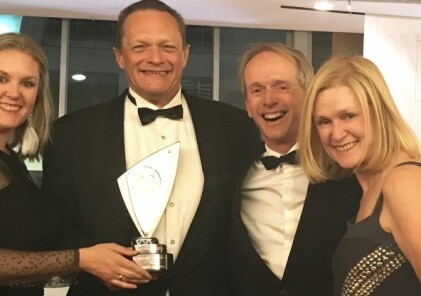 This group of firm friends has arisen from FH parkrun and are cleaning up the prizes at the FH athletics club where signed up as members to run the longer races at all distances 10k,. 15/16km, half marathon, marathon and even Ultra marathon. At a recent coffee get together, this diverse group realised the massive role that parkrun has played, they’ve toured parkruns together, they’ve trained for races together and raced each other. What are the facilities like? There is plenty of parking, right at the start, as long as have around 400-500 people. There are sports club facilities around, but none are open before 9am.